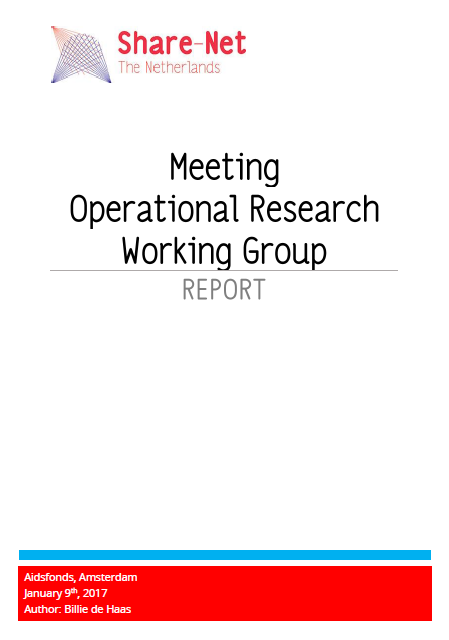 The Share-Net Netherlands working group “Operational Research” was founded in 2013 after various Share-Net member organisations were granted DGIS funding from the Dutch Ministry of Foreign Affairs in 2012. This funding included a newly-added operational research component. Since that time, the working group has been meeting on a regular basis to share members’ experiences of conducting operational research. As such, the working group contributes to Share-Net Netherlands’ objective to enhance the development of evidence-informed policy and practice and societal-relevant research. The meeting was hosted by Aidsfonds in Amsterdam. We welcomed twelve participants working at NGOs and in academia. The meeting was chaired by Billie de Haas, who works as an independent consultant and organised this meeting on behalf of the Share-Net Netherlands secretariat. First, this report presents the most important lessons learned as discussed by Miranda van Reeuwijk and Ellen Eiling, and complemented by the other participants. Then, suggestions for future activities for the working group “Operational Research” are given, followed by a short conclusion and discussion including recommendations for Share-Net Netherlands. Please click here for the full Share-Net report OR working group meeting in pdf.